Investors have long shunned China’s state-owned enterprises (SOEs) over concerns of misaligned incentives between companies’ management and their shareholders. However, as with most things in China, determining the influence of the state in a given company, and what that means for investors, is a surprisingly nuanced exercise. Ownership is one measure, but financial, management or other avenues of control exist as well. As a first order estimate, we can approximate the reach of the state in China’s economy by simply looking to the official company registration status. Local stock markets, originally hatched as a mechanism for capitalizing and modernizing SOEs, have since attracted significant private sector participation, especially over the last decade. Today, most listed companies are, in fact, private sector. How does China define company registration? For the government, the identity of the controlling shareholder—that is, the legal entity with the power to appoint and remove board members—sufficiently designates a company as either state or private sector. In the case of private sector companies, the controlling shareholder is a person, or often a family. SOEs, on the other hand, are controlled by either a cabinet-level ministry or a state holding company responsible for preserving and managing state-owned assets, called a SASAC. Although the official taxonomy is quite straightforward, there are two reasons why this first-order approximation needs significant refinement if we are to truly understand the reach of the state. In fact, not only is the state more involved in the economy than China’s company registration statistics imply, the state vs private sector distinction poorly describes the relationship of any given company to the state. Mixed ownership, in particular, muddies China’s company registration taxonomy. Of the 1,600 private sector listed companies in China, 23% count either Huijin or the CSF as one of their top shareholders. Note, Huijin is owned by China Investment Corporation, which is owned by the ministry of Finance, which reports to the State Council. The CSF is owned collectively by China’s stock, commodities and futures exchanges, which are all regulated by the CSRC, which is a cabinet-level ministry directly under, you guessed it, the State Council. In other words, minority owners of nearly a quarter of Chinese private sector listed companies report at least indirectly to the State Council—that is, President Xi. Mixed ownership permeates the state sector as well. 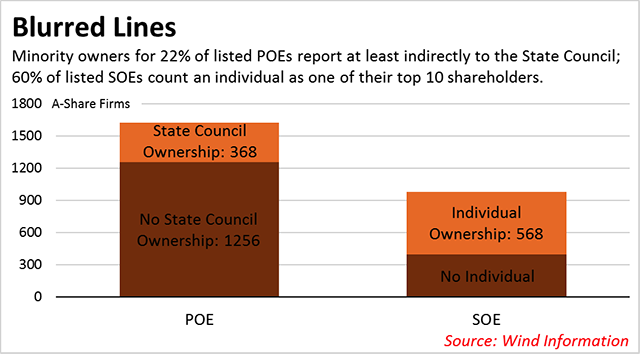 In fact, nearly 60% of China’s 980 listed SOEs count an individual as one of their top 10 shareholders. 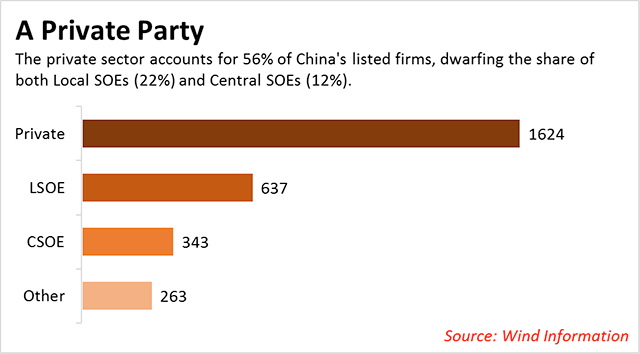 Functionally, SOEs and large POEs in China share many similarities in the areas commonly thought to distinguish state-owned firms from privately owned firms: market access, receipt of state subsidies, proximity to state power, and execution of the government’s policy objectives. Which is to say, the ownership of state-owned or private sector companies fails to define sufficiently the scope of state involvement. To understand the blurred lines between China’s state and private sectors, let’s consider three dimensions of state intervention: management control, financial control and extra-legal control. First, although SOE managers are appointed by the party and SASAC, the checks on their power fail to rein in significant rent-seeking behavior and private-benefits capture. Despite a compensation cap set at 20 times the average worker pay, so called “on-duty consumption”—which Milhaupt and Zheng describe as “a catchall category of perquisites, expense accounts and side payments that often significantly exceed a manager’s formal compensation”—is such a problem with SOE managers that frequent rotations from SASAC are the only way the party can control them. On the flip side, many entrepreneurs are themselves CCP members, blurring the line between the private sector and state influence. Thus, the state exerts both less control over SOEs and more control over private sector companies than ownership would imply. Second, a curiosity of China’s “state” ownership is that the state actually collects little to nothing in dividends from SOEs. SASAC finally began to collect a nominal amount of dividends from SOEs in 2007, but the majority of that is remitted back to the SOEs through cash subsidies. 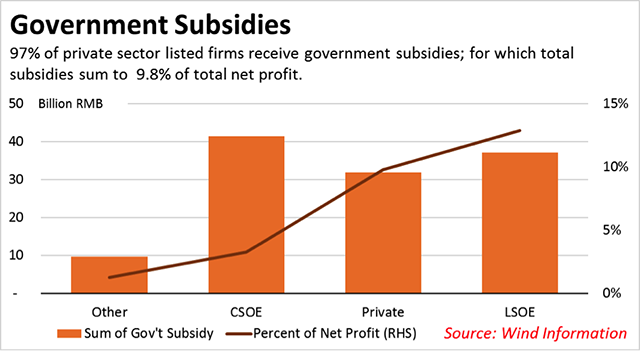 Additionally, the government provides significant subsidies to the private sector as well; in fact, for listed companies in China, total subsidies to the private sector equal nearly 10 percent of total net profit. Third, consider the role of the state in regulating enterprise. Rather than controlling companies through a legal regulatory framework, the state often bypasses regulators to exert direct extra-legal control over both state and private sector management. For example, in 2010 China’s cooking oil producers were considering raising prices to combat cost pressures. Fearing inflation, the NDRC conducted “interviews” with the management of producers, after which the price of cooking oil was frozen for four months. Although many investors profess to shun China’s SOEs over concerns regarding the profit-making motives of management, it is clear that a more nuanced understanding of the demarcations between private and state interests is required to understand China’s complex political-economic ecosystem.